To date, I’ve been teaching at the university level for nearly 20 years, beginning with the foreign language courses I taught when I was a graduate student. I have a Masters degree in German (literature) and my MFA terminal degree is in Fiction. Besides teaching, I’ve worked as a bookseller, a sometime translator, a curator’s assistant, and an editor. But my lifelong activity has been writing stories. As a teacher of creative writing, I would come around to thinking about what textbook on the subject I would put together. I thought about a “course in a textbook,” one that would take beginning student writers through a similar disciplinary path that writers take, albeit at a beginner level. Why not? Why not even encourage beginning writers to have their own work dialogue with those of others, peer and established? It’s no secret that writing better involves reading, and so I see it as my responsibility to involve students to read examples of the genres we study in class — nonfiction, poetry, and fiction — and to further their intellectual and creative endeavors as writers of contemporary work themselves in this way. Why not engender and guide good dialogue about these works? Coupling readings with then a dialogue about them help tremendously. Such a dialogue may focus on the technical aspects of, say, a fictional narrative and the resulting chemistry of authorial choices (point of view, setting, diction, etc. ), less so on providing an interpretation of the narrative. And then, on top of this, how about writing exercises that help students have a better grasp on the significance of a just-studied literary component? In a week devoted to characterization, for example, I’ll have students read and discuss the opening chapter of a certain book and look at how the author distinguishes characters from each other and makes identifiable main characters from the get-go. I’ll use the lesson to lecture for a bit on EM Forster’s concepts of flat and round characters. Then, I’ll follow up on the lesson to do one of the more popular exercises that I assign to the students called the “stalker” exercise, which is a variation, I’m sure, of the many types of people-watching writing exercises out there. The “stalker” exercise involves students in the search for possible characters in strangers. They’re asked to watch how people interact or to listen in on how they talk and sound. Then, I give them a questionnaire that allows them to create a profile for their newfound character, as well as a prompt to develop a scene in which to involve them. Creative writing – whatever the genre you choose to teach – is always an exercise in empathy. In this light, you’ll find that my choices in reading material feature works by writers from underrepresented communities. I’m optimistic in maintaining that the world isn’t flat. It’s got texture and conflict and color and scents and noise and accents, and a diversity in culture and thought and outlook, etc., etc. Creative writing isn’t just about letting your imagination run wild, but rather it’s utilizing your imagination – to loosely paraphrase Hannah Arendt and her work on perceptions of evil – to find the complexity in a human being or situation and dare to identify with that character or circumstance. It’s this consciousness of the greater implications of creative writing that I particularly encourage in some of the students I’ve come across who want to write about where they come from but are afraid to do so. I encourage these beginning-writers to recognize that they are the best people to tell that story about where they come from and about their former circumstances. So instead of the motive to only entertain, perhaps now a drive to explore emotional truths becomes the priority or perhaps to write stories that contribute to, as one mentor of mine put it, “a literature of witness” becomes more important. Perhaps now a greater confidence that writing about where one comes from does matter — and should matter — becomes more profound a pursuit. So in shaping class discussions, or when we come around to workshopping peer work, I don’t just aim for technical recognition and application, for a recognition of the craft that we are engaging in as a studio art. We’re not just dialoging about student writing within technical lines and resulting chemistry of choices, but we’re also working from a desire to recognize the greater implications of what we are doing. I created this textbook to help facilitate these specific and more philosophical aims that I’ve just explained. Whenever I teach a group of beginning contemporary writers, I find it helpful to expose them to contemporary readings, thereby giving them examples of how writers view our current human experiences and express them on paper. From my own undergraduate experiences, I found that the instructors who provided reading questions and discussion questions to be the most helpful. I knew then what was being expected of me, and so therefore, could better prepare for a session. In a creative writing course, reading and discussion questions to go along with a story can help to draw students’ critical thinking more toward authorial choices and resulting chemistry of choices, less so on the interpretation of it. Moreover, if assigned beforehand, the discussion questions can function as follow-up questions post-reading that help prepare the student for the upcoming class session. The writing exercises portion is meant to generate material, to transform the student’s initial reflection on these authorial choices to student action, that is, to using these choices in their own creative works. Finally — and this is shaped by what I felt to be one of the most fantastic parts of my own MFA experience — I’ve included so called “craft talks,” which is more dialogue (there can never be too many) on a variety of subtopics relevant to the discipline of creative writing by a variety of practitioners reflecting upon their own workshop experiences, a creative writing mentor, or what they came away with from a cherished work. This helps to drive home the idea of the craft of writing — nonfiction, poetry, or fiction – as a process one must continually work on and in which one must mindfully participate, if one wants to, for a lifetime. On one level, this book is aimed for students in creative writing courses, whether this is in a large lecture or small workshop setting. Potentially, it also may appeal to any instructor aiming to include creative writing portions in non-creative writing courses. Besides the students, the book aims also to take into account you yourself — the instructor of creative writing— who, like me, was oftentimes seeking more than just a reader for their students. 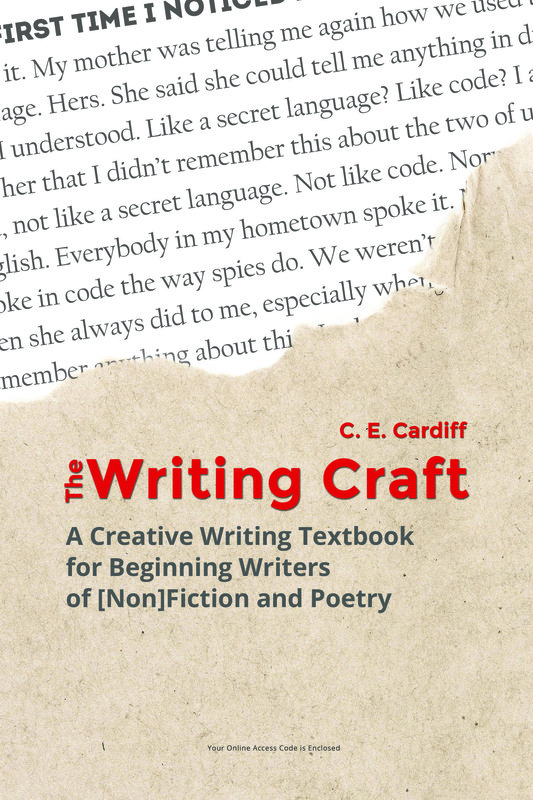 Though it’s written with university-level creative writing courses in mind, this textbook may also be of help to high school-level courses who themselves aim to challenge their students toward college-level goals. Writing Exercises: Experiment with the Form! — featuring Catherin Brereton, "Trance"
Writing Exercises: Experiment with the Form! Claire Davis. "The Habit of Art"